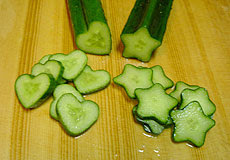 These heart and star cucumbers make me happy in the same way the happy-face fireworks do. There are fireworks cubes, hearts and planets, but the happy faces make my summer. I sorta believe in Friday the 13th cause my mom's car almost go totaled by a drunk driver at 11:30pm he did'nt even have a license! The cucumbers remind me of carambola which are long fruits, that when sliced, are star shaped. 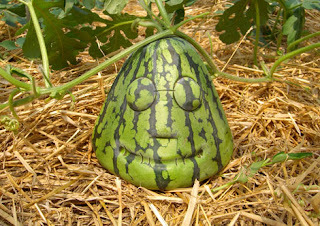 They were my favorite fruit as a child.